“Happy Birthday” has been Jamison’s preferred greeting for months. Maybe he thought we would forget his birthday was soon approaching. No chance of that! We celebrated Jamison’s birthday in traditional Logan style: multiple days of friends, family, and fun. Earlier this week, Jamison and a few friends visited the corn maze on Sauvie Island. Yesterday we traveled by train, picked out a couple of pumpkins among acres of choices, and floated by boat at Lakeview Farms. 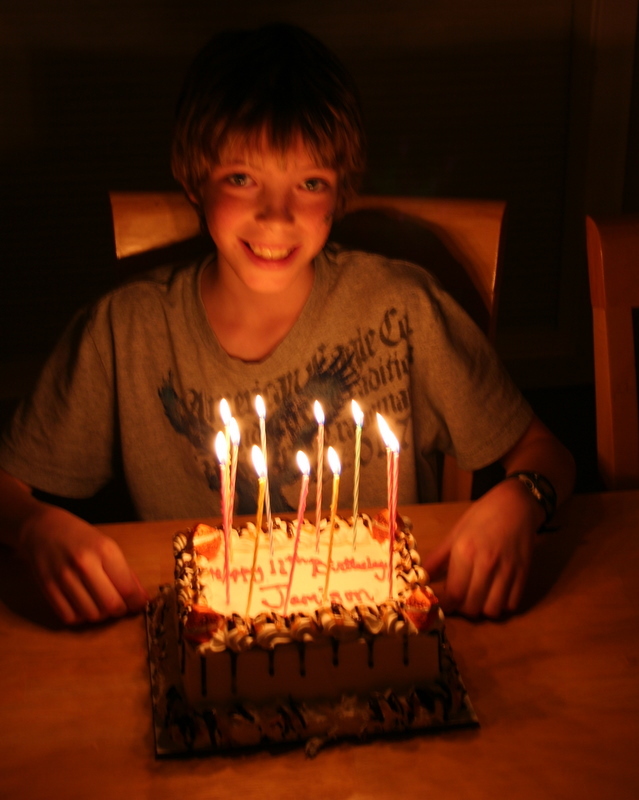 In the evening, we lighted candles, slaughtered “Happy Birthday,” and gorged on birthday cake. Jamison opened presents. Let me just say that the Nerf Vulcan and the Wii Outdoor Challenge are both stupid fun — and I mean that in the best of ways. We stayed up ’till midnight to ring in Jamison’s birthday and then retired, knowing Jamison had set his alarm for shortly before his birth hour of o’dark thirty. The alarm didn’t awake and neither did Jamison until 3 AM. After a couple befuddled “happy birthdays” we returned to our slumber. 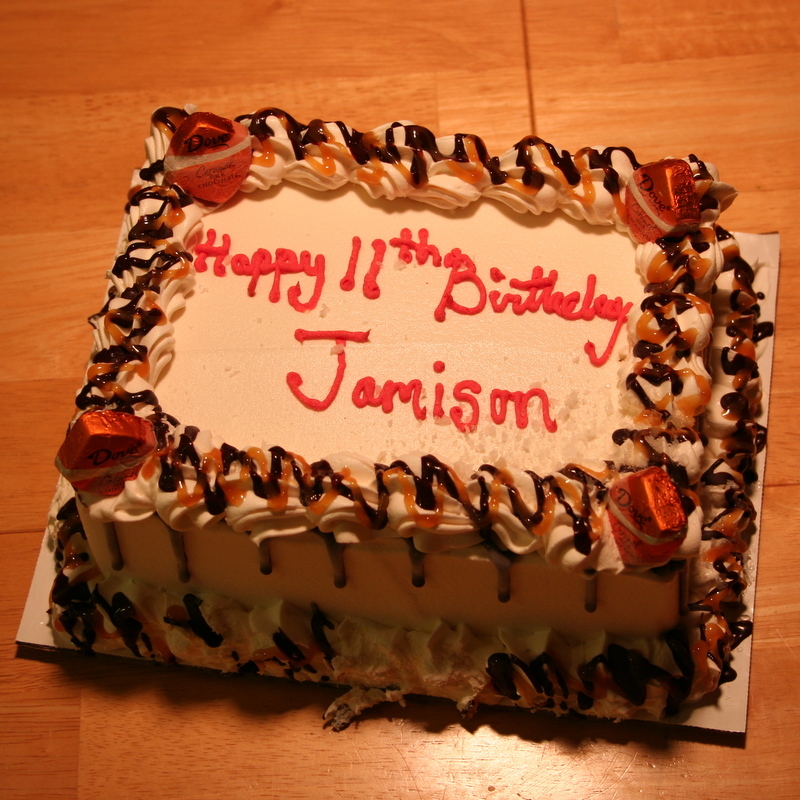 Today, Jamison is eleven. Happy birthday, son. I’m proud of you! Sounds like a great party. The Nerf Vulcan needs careful evaluation by your safety-concerned friends. I’ll be over to give it a complete safety check . We have enough Nerf artillery to arm the neighborhood. My favorite is the N-Strike Maverick. Sounds like a great job! I worked at a high-tech company where every Friday was “office supplies weapons day.” We made all sorts of cool stuff. Sounds like a great birthday party(s)! We had fun. Now we’re looking forward to Thanksgiving (our big family reunion in Northern California) and Christmas (more family here in Oregon and a wedding in Washington).